My modelling skills are limited to NifSkope, so no hard feelings at all if you end not using that half-baked, makeshifted model. It's just a proof of concept, really. By the way, I truly recommend BoUT 1 & 2 to everyone. I'm not a fan of the genre (point and click adventure games) at all, and I enjoyed it sooo much. So creative, hearthwarming, adorable and funny games. I like this idea, berry! And it does fit really well with the Ouag Tong. I tested it out in game and it looks like there are some issues with the alpha-ed meshes not playing nicely with each other. I'm going to try playing with a NiZBufferProperty and see if I can get it to display properly. I'm glad you like it! Just to make a credits part clear, besides your Ashlander lantern I used Qarl's jar with floating eyes, LadyE's jellyfishes and PB's distinct summons glow. Looking again at that screen I posted, I think it could be better to separate this into two lanterns actually, purple-blueish and red-pinkish, based on the jellyfish color. Maybe textures from this mod could come in handy for that? I don't know how it's called, but a glowing aura, such as seen here, around PC's Welkynd stone model, would serve this model well, too. Yeah, took me a second to think of where you got the animation from. And I am going to add a glow around the light as you suggest. HedgeHog has a really good one that utilizes mipmaps that I've used in a couple of my other lanterns. My test in game makes the lanterns a pinkish-red (I guess a coral color) which worked really well. If I can get the alpha to work, I'll post a screen. It's being difficult. Morrowind's engine does NOT like rendering multiple alpha-enabled models over one another... one almost always overwrites the others. 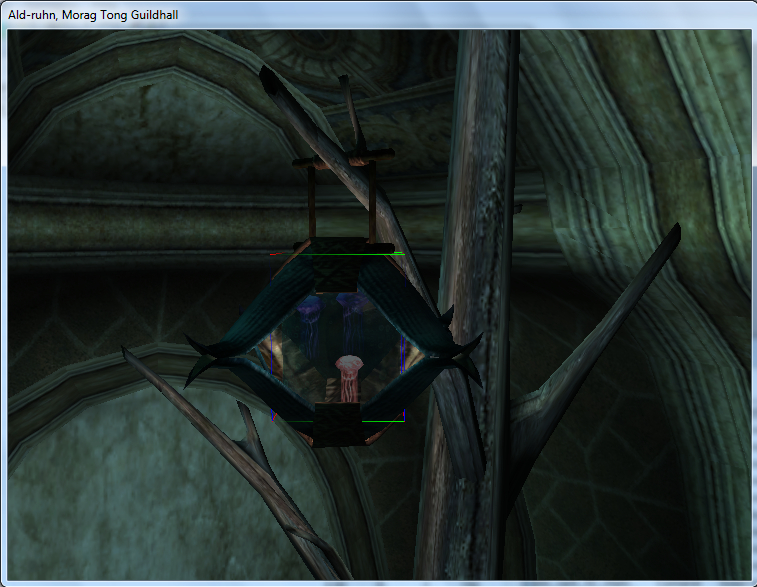 Dang, I found an issue with qarl's animation on that eyeball jar. Only 1 of the eyes actually properly animates in game... I'm going to see if I can take the one that works and copy it or something. Good news! I was able to fix the animation issue! All but one of the eyeballs were set to clamp rather than cycle the animation. So I made a few tweaks and finished up the jellyfish light. That's just beautiul. You are a wizard. I'm happy I particapated in making your isles even more magical place. Sorry I caused you so much headache with this model. Telling from that screen and video it was damn worth it though, if I dare say so. Without your inspiration, I never would have made it! And without your concept, it would have turned out very differently. Thank you very much. I really like how it enhances the atmosphere of the place. It was definitely worth the effort.